When Turner showed up on campus in fall of 1980, many took notice of this tall kid with exceptional basketball talent. As a freshman, Turner was elevated to the varsity team where he saw limited playing time in pre season tournaments, and when league play came around, he finished the season on the JV team. However, for the next three seasons, Turner established himself as one of the best basketball players in the city. “From his sophomore to senior season, Joe made tremendous strides as a player and leader of our team,” states Turner’s Head Coach at Foothill, Dan Shannon. “Joe was a self-made player that put a lot of time in the offseason to improve his game. Joe was the first big man that I ever coached that was a prototype at the forward/big man position. For his size, he was extremely athletic, had great hands, excelled in court awareness, and could run the floor better than anyone. I haven’t seen too many players since Joe that could do what he did at his size,” continued Shannon. With such athleticism, Turner was known around town as “Jumpin’ Joe” for his leaping ability and tenacity on the rebounds. In his senior year, Turner led Foothill to a 23-1 record his senior year, winning the South Yosemite League and a CIF Central Section Valley Championship for the Trojans. Furthermore, he helped Foothill gain the right to play in the CIF State Division 1 State Final Four. Individually, Turner was named the San Joaquin CIF Player of the Year and was selected to the nationally recognized McDonald’s All American Honorable Mention. Outside of basketball, Turner also excelled on the Trojans track and field team for four years, participating in the triple jump, long jump, and high jump, of which he qualified for the Valley in his senior year. After playing for the Trojans, Turner was offered a scholarship and played for the University of Arizona under legendary coach, Lute Olson. “Joe was recruited by like 50-75 schools, but Arizona is where he wanted to be,” states Shannon. “Arizona was able to use his athleticism as a 3,4, or 5 making him invaluable as a key contributor for the Wildcats. Joe Turner was a coaches dream - even for Coach Olson.” While Turner was at Arizona, the Wildcats played in the NCAA Tournament 4 years in a row, won two PAC-10 Championships in 1986 and 1988, and made it to the Final Four during Turners senior season, before losing to University of Oklahoma in a tightly contested game. The Sooners would then lose to the University of Kansas for the national championship. After being a Wildcat, Turner spent eight seasons playing professional basketball in New Zealand, Australia, and Europe before returning home to Bakersfield. With his loyalty to his alma mater, Turner took to working at Foothill as a community counselor and as the head coach for the varsity basketball team. In 2014, Joe Turner was selected to the Foothill High School Hall of Fame for the legacy that he created as a Trojan, and for the accomplishments he achieved in college and beyond. Joe Turner was a key player for the Arizona Wildcats and Lute Olson from 1984-1988. Perhaps, Turner’s biggest accomplishment was meeting his wife while he played professionally in New Zealand. Turner met Elaine and the two would marry and end up having four kids in New Zealand. Eventually, the young family decided to move back to Bakersfield to raise a family. Each of their four kids that were born in New Zealand would join dad at work as they attended Foothill High School where they excelled. Jazmin Turner (Class of 2012) Jade Turner (Class of 2014) Ebony Turner (Class of 2015) and Ethan Turner (Class of 2017) all excelled academically, athletically in sports like volleyball and track, and all enrolled in a university after high school. Despite such success in athletics and academics, none of the Turner children carried on their father’s legacy of basketball superstardom. When “Squid” stepped onto Foothill’s campus his freshman year, he quickly made his presence known on the basketball court. As a freshman, he started on the JV team where he dominated. “As a freshman, ‘Squid’ absolutely dominated the JV level,” recalls David. “My varsity team was off to a rough start where we lost seven straight to open the season. In looking at his play, I decided to bring ‘Squid’ up to varsity in December of his freshman year. We finished the season 8-18 overall and 4-4 in league play. We were able to win some games because of the play of ‘Squid.’” As a freshman, the young Turner ended up averaging just 8 points per game and 6 rebounds per game. Last year, ‘Squid’ continued to gain more and more confidence as a Foothill Trojan. He had a solid sophomore campaign in which he averaged 10 points per game and another 12 rebounds per game. More importantly for “Squid,” his team made the CIF Central Section Division 4 playoffs for the first time in a long time for the Foothill Trojans. “Foothill hadn’t been to the playoffs in well over a decade - since about 2000,” states Davis. “So simply going to the playoffs meant the world to our program and to our school.” Foothill lost in the opening round by five points, yet this loss seemed to motivate “Squid” to take his game to the next level because that coveted valley championship was all he could think about. “After we lost, I wanted to get back to playoffs as quickly as I could,” states the young Turner. “Squid” reflected on his offseason training as it helped him to focus on various aspects of his game. “My focus now is to keep improving each and every day, being the best player I can for my team. The first goal that I have is for my team on The Hill want to win league, but the ultimate goal is that Valley Championship,” states the young Turner. "Squid" Turner is an imposing force for the Foothill Trojans. 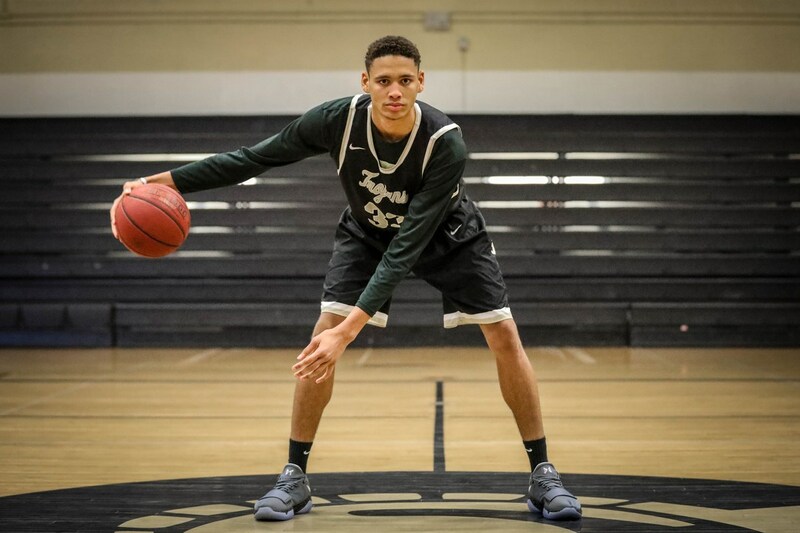 has established himself as one of the best basketball players in Kern County. In the early 1980s, “Jumpin Joe” Turner established his legacy as one of the top basketball players to ever play in Bakersfield, while helping to build Foothill High School into a basketball power. 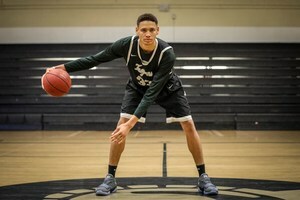 In 2018, his son Edward “Squid” Turner is creating his own legacy as one of the top basketball talents in Bakersfield while also helping to rebuild Foothill into a basketball power once again.